The owners of opera houses in Paris in the 1820s would hire "claquers" to applaud enthusiastically. 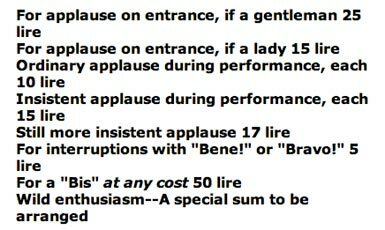 A company called the Italian Claquers put this advertisement into the Musical Times newspaper, advertising their rates for various kinds of applause. We're all suckers some of the time. And many of those times it happens because we feel uncertain, look around, see what others are doing, and do the same. Cialdini reminds us that looking for what he calls "social validation" or "social proof" may lead us astray, but as with all the compliance triggers he discusses, this instinct can be helpful to us in times of uncertainty. Usually, when a lot of people are doing something, it is the right thing to do. ...the problem comes when we begin responding to social proof in such a mindless and reflexive fashion that we can be fooled by partial or fake evidence. His examples of minor occasions when we are manipulated by social validation includes joining in with sitcom laugh tracks, being moved to tip by the bartender who displays a jar full of dollars, and emulating the lists of donors thanked during pledgathons. Following our instinct to base our behavior on social proof can however lead to genuinely bad consequences. Cialdini discusses the notorious case of the 1964 murder of Catherine Genovese: "for more than half an hour, thirty eight respectable, law-abiding citizens in Queens watched a killer stalk and stab a woman in three separate attacks." Why didn't anyone intervene or at least call the police? Newspapers agonized over the question for weeks, accusing urban society of becoming newly "cold" or apathetic. Social psychologists propose a different explanation: Genovese got no help because, in a confusing situation, all thirty eight witness thought first, someone else is doing something, and second, since I don't see or hear others intervening, I must be misconstruing that woman's screams, she must not need help. The search for social validation in an unfamiliar and threatening situation froze the observers. Cialdini describes finding himself at risk in such a situation: after an auto accident in a busy intersection in which both he and the other driver were injured, cars began to simply pull around their stopped vehicles. He roused himself, although bloody and disoriented, to point to particular drivers saying "You! Call the police;" "You! Call an ambulance." etc. He reports that "not only was [their] help rapid and solicitous, it was infectious. After drivers entering the intersection from the other direction saw cars stopping for me, they stopped and began tending the other driver." Understanding how to use the instinct most of us have to do what we see others doing got the professor and the other driver to the hospital promptly. Following the prompting of social proof can also get people killed. Cialdini ascribes the willingness of 910 members of the Reverend Jim Jones' Peoples Temple to commit mass suicide in its Guyana colony in 1978 to their isolation in an environment where their only mooring was the behavior of other members. So where do we see the weapon of social proof in contemporary politics? Everywhere. President Dubya only appears before audiences that have been carefully screened to remove skeptics and hecklers -- the resulting "film at 11" reinforces the false notion that everyone loves GWB. Pollsters churn out their results; candidates who show any promise in the polls run to potential donors with "proof" they are a good investment. Meanwhile, out at doors in neighborhoods, political field volunteers try to get across to reluctant voters that "everyone" is turning out for their candidate. Everyone working on the campaign wears a button or sticker at all times; this serves to remind everyone they meet that something is happening. And they give away or sell those buttons and stickers to everyone they encounter to magnify the effect. You always collect as many names of sympathizers as possible. The tip about that is: on every sign-in list, petition, or whatever device you use to collect those names, fill in the first line on every page with all the information you want. All subsequent signers will fill it in fully, just like the first one. You may be tempted not to call important people or big donors on your list when recruiting volunteers. Don't give in to that. They (probably) won't come out and work with you, but they carry a lot of weight with others; they are dispensers of social proof. A remark from one of them that such and such campaign called to ask me to work last night can get you additional volunteers or donors. If there are more volunteers than can be used for targeted outreach to voters, do send them to public places to wave signs, blow horns, or whatever gets them noticed. This seems wacky, but once again, you are making living social proof for your message. We all do it. Electoral organizing often amounts to "applied social validation." hey, good idea. application of psychology to organizing. i should review my psych text books.